Is Magnesium Deficiency an epidemic in the US? A quick internet search reveals that anywhere from around 50% to a whopping 80% of the US population may not be getting enough magnesium in their diets. This is huge. Magnesium is responsible for over 300 biochemical reactions in our bodies, and without it, many things can go seriously wrong. At the same time, adding a good magnesium supplement can also help many things get better. I can attest to this first hand. I was having problems with constipation when I switched to a keto diet. I tripled my daily intake of magnesium from about 163mg to about 488mg and felt better the very next day. I’m back to having one or two good bowel movements every day. People on a ketogenic diet should take a good magnesium supplement, among other minerals, because it is hard to get enough on a very low carb diet. Learn more about supplements recommended for a keto diet here. What are some common symptoms of Magnesium Deficiency? The biggest culprits of the magnesium deficiency epidemic are processed food and modern farming practices. Our ancestors didn’t have to worry about magnesium deficiency because they grew the food they ate and practiced more sustainable farming. Soil depletion is, of course, a cause, but also, modern famers have been breeding fruits and vegetables not for their nutrient content, but for size, greater yield, and pest resistance. Many fruits and vegetables just aren’t as nutritious as they were in the mid 1900s. What are some of the potential health benefits of taking a good magnesium supplement? Because magnesium is vital to so many biochemical reactions, taking a high quality magnesium supplement may help with many issues. What is the connection between Magnesium and Calcium? Magnesium and calcium balance each other in multiple ways in our bodies. Magnesium helps our muscles relax where calcium is required for contraction of muscles. We know calcium strengthens and hardens our bones, but do you know that magnesium gives them them elasticity so they can flex, which helps them resist breaking? Magnesium is required for the absorption of calcium into our blood, where it can get properly used by our bodies. When they are out of balance, calcium gets into cells and places it doesn’t belong and calcification occurs. You’ve probably heard of calcification of the arteries and joints, but other soft tissues are also at risk of calcification. According to Dr. Mercola, the ideal ratio of calcium to magnesium is 1:1. This isn’t always easy. Due to the rise in osteoporosis, there is a lot of food fortified with calcium – milk, orange juice, cereals and more. I can’t think of anything that is fortified with magnesium. And, calcium has been a very popular supplement for avoiding osteoporosis, so many women are taking a calcium supplement. If you are, make sure it also contains an equal amount of magnesium or start taking a magnesium supplement as well. Many calcium supplements have twice as much calcium as magnesium, but Dr. Mercola says this 2:1 ratio was a misinterpreted from a French doctor and we actually need equal amounts. What foods are high in Magnesium? How do I get more Magnesium in my diet? My very favorite magnesium rich food is also a great source of naturally occurring magnesium – dark chocolate. There are about 93 mg of magnesium in 6 oz of dark chocolate, depending on brand. Check out this post to find out more about the health benefits of chocolate. I know it’s not easy to eat fresh food every day, every meal. If you’re worried you aren’t getting enough magnesium from your food, then a high quality magnesium supplement is a good idea and Nourishing World has you covered. My favorite magnesium supplement used to be Natural Calm from Natural Vitality. That recently changed. 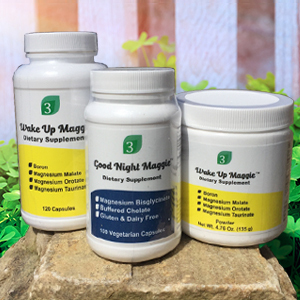 My new favorite natural magnesium supplement is Wake Up Maggie from Organic3. This is a high quality magnesium supplement with three different kinds of elemental magnesium plus boron for maximum absorbability. It comes in powder or capsule form for your convenience. The counterpart is their Good Night Maggie specially formulated for helping people relax so they can fall asleep. Organic3 recommends taking both daily to get four fantastic forms of magnesium in our bodies. The Catie’s Whole Plant Food Magnesium is also a good magnesium supplement. Some people find taking magnesium orally has too much of a laxative effect. If you have this problem, then try Ancient Minerals topical magnesium. Transdermal magnesium is highly absorbable and an excellent way to get your magnesium supplement. If you think you are one among the many who don’t get enough magnesium in your diet, then try adjusting your diet, or start taking one of these high quality magnesium supplements. Your body will thank you. ← Bone Broth: Comfort food that’s so good for you!